Carnegie’s Pathways—Quantway and Statway—for students placing into development mathematics have had notable success in their first implementation. Over 51 percent of Statway students successfully completed the entire pathway, including earning a college-level credit in statistics in one year, compared to 6 percent of a baseline comparison group attempting the traditional sequence in a year. Even when expanding the timeframe for the traditional group to three years, only 20 percent of the entering cohort achieved transfer-level success, again compared to the Statway rate of 51 percent. These results represent a 250 percent increase in one year success over the conventional approach extended to three years. For the eight colleges starting Quantway in spring 2012, results were just as heartening. Achieving results like these generated a good deal of interest from institutions and faculty members. But as Rob Johnstone, with the National Center for Inquiry and Improvement, writes in a Carnegie-commissioned Return on Investment (ROI) study, “While programs such as Statway and Quantway may very well demonstrate an impressive improvement in student outcomes, a significant concern still emerges from a college standpoint: Can we afford to do this at scale?” Johnstone finds that Statway and Quantway very well may make money for an institution. For a relatively modest initial investment of upfront costs that very often is less than the costs of boutique programs, Statway and Quantway can be implemented at scale for the entire range of students needing such an alternate approach rather than for the handful of students served by most boutique programs. 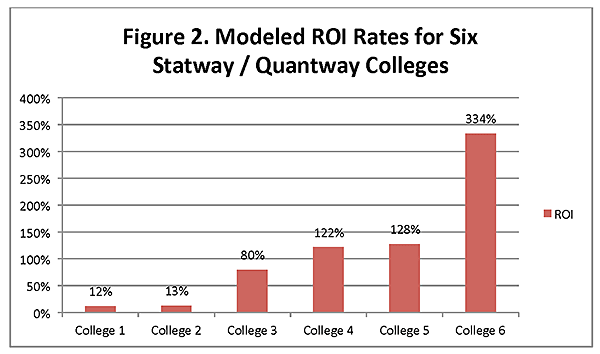 When Johnstone studied the six Pathways colleges who were selected to participate in the ROI modeling exercise, he found that even with relatively conservative estimates on downstream FTEs generated by successful Statway and Quantway students, the model generated a positive return on investment with an associated positive net revenue figure every time. 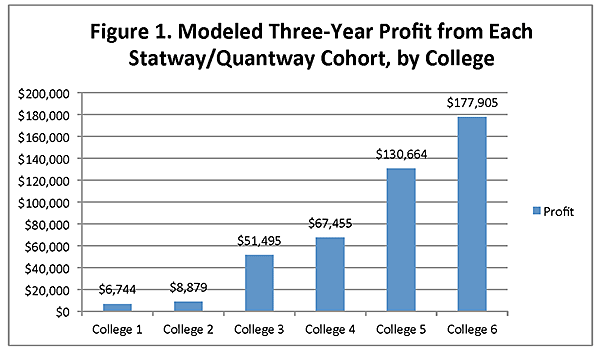 Figure 1 provides the modeled net revenue figures over a three-year period for each of the six colleges associated with a single Statway or Quantway cohort, ranging from $6,744 to $177,905. After calculating these incremental net revenue figures using the model noted in Figure 1, Johnstone also calculated a classic ROI rate. In Figure 2, ROI is calculated by taking the incremental net revenue associated with a program and dividing it by the total incremental program costs. The ROI rates produced by the model, even with reasonably conservative estimates, were all positive, and ranged from 12 percent to 334 percent. Note that even the 12 percent ROI indicates that the college would generate net revenue that is 12 percent higher than the incremental program costs. From industry standards, ROI rates that are above 50 percent (achieved in three of the six sampled colleges) are considered quite high and those over 100 percent (as observed in three of the six) are extremely high. Taken together, the results of these ROI models are quite positive, Johnstone notes, concluding that in addition to the more important outcome of getting 2.5 times as many students to succeed in transfer-level mathematics in one year as a traditional group did in three years, the ROI models suggest that Statway and Quantway will likely be able to achieve this outcome at a net revenue gain to these colleges. Teacher evaluation has evolved markedly over the past four years. Unsurprisingly, consequent proliferation of evaluation systems has also yielded a great deal of variation in terms of system design, structure, and coherence. In its second year, Carnegie’s Community College Pathways program sustained its high level of student success while also experiencing a growth in the number of students enrolled and the number of campuses teaching Pathways.